The prototype PCB had a few errors but everything is working fine now. 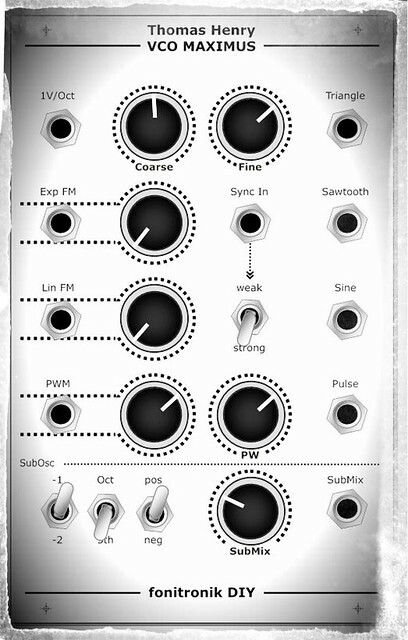 So i made an eurorack front panel layout today, showing the features. .Outstanding! I've been waiting for this, I have a small cache of older pre-revG chips in my parts box that I have been wanting to use since Mr Henry announced the design. I'll definitely need a handful of these boards. Thanks Matthias, for what is sure to be another winning PCB design! I'm a 5U guy, so I'll be making my own front panels and will only need main PCB's. I'm thinking 6 or 8 boards, maybe more. Can't wait to hear how the Maximus sounds next to my 555's! 4 regular PCBs for me. steve from thonk knows this and always orders extra maon PCBs. this is important to us, since Thomas' projects always aim to real DIY and not to a specific format. however, i don't have an online shop and doing PCB runs and direct sales are beyond my capability these days. so everything will be sold via retailers. nonetheless, you might PM r email me if you want more than 10pcs of main PCBs only (email in w-m-footer works). i will announce it here as soon as everything is available. you can see the panel graphics above. it is a little bit lighter style, the same i use for the QFG and the VC X-fader/VCA (soon available via thonk).